When I was about 7 or 8 we moved to a new house and within about three months or so, we not only had the entire brood, Mom, Dad, four kids, three cats and a couple of guinea pigs, but we seemed to have “inherited” a stray Irish setter. To my recollection, this was the family’s first dog, although apparently there was actually another Irish setter that died when I was 2 or 3. Candy very much exhibited some of the most common traits of her breed. She was fiercely protective of all four of the kids, but was never violent. She would stand between us and whatever she felt was a threat and maybe a low growl once in a while, but she simply wanted to protect and serve. She would even take up for the cats on occasion! She was very playful and frequently would visit the pond with us where she would splash enthusiastically, often drenching us in the process. Whenever we were outside, Candy would trot along with us, just seeming to be enjoying the attention. If we went on vacation, or were gone for a few days, our neighbor, who was taking care of all our ‘critters’, would say Candy would come down to their house for a bit as if just seeking human contact or companionship. That need is also typical of the Setters. Unfortunately, Candy suffered from hip dysplasia which eventually caused her to be unable to walk and that, along with old age, cost her her life. 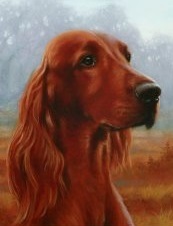 Irish setters, though, are excellent family dogs!